Maurice Martenot a Cellist and radio Telegraphist, met the Russian electronic engineer Leon Termen in 1923, this meeting lead him to design an instrument based on Termens ideas, the first model, the “Ondes-Martenot” was patented on the 2nd of April 1928 under the name “Perfectionnements aux instruments de musique électriques” (improvements to electronic music instruments). His aim was to produce a versatile electronic instrument that was immediately familiar to orchestral musicians. The first versions bore little resemblance to the later production models: consisting of two table mounted units controlled by a performer who manipulated a string attached to a finger ring (using the bodies capacitance to control the sound characteristics in a manner very similar to the Theremin) this device was later incorporated as a fingerboard strip above the keyboard. Later versions used a standard keyboard.The Ondes-Martenot became the first succesfull electronic instrument and the only one of its generation that is still used by orchestras today, Martenot himself became, 20 years after its invention, a professor at the Paris Conservatoire teaching lessons in the Ondes-Martenot. The Ondes-Martenot’s success was the Theremins loss, although both used the vacuum tube oscillator as a sound source and were both monophonic, where the Theremin had a sliding scale and no fixed preset notes the Ondes-Martenot had a keyboard and a strip control for glissando and vibrato, organ like stops for preset timbres and an appearance that was familiar to any keyboard player. Onde (O): A simple sine wave timbre. Similar in sound to the flute or ocarina. Creux (C): A peak-limited triangle wave. Similar in sound to a clarinet in high registers. Gambe (G): A timbre somewhat resembling a square wave. Intended to be similar in sound to string instruments, as the French title would suggest. Petit Gambe (g): A similar but less harmonically-rich timbre than Gambe. The player can control the number of harmonics present in the signal by using a slider situated in the control drawer. Nasillard (N): A timbre resembling a pulse wave. Similar in sound to a bassoon in low registers. Octaviant (8): A timbre with a reinforced first harmonic whose intensity in the signal can be controlled by using a slider. This setting is analogous to the 4 foot stop in organ terminology. Souffle (S): A timbre often described as white noise, but in fact pink noise of indefinite pitch. ‘Principal’ A traditional, large loudspeaker. ‘Résonance’ A loudspeaker which uses springs to produce a mechanical reverb effect. ‘Métallique’ A small gong is used as the loudspeaker diaphragm to produce a ‘halo’ effect rich in harmonics. ‘Palme’ An iconic lyre-shaped loudspeaker, using strings to produce sympathetic resonances. The instrument also had a bank of expression keys that allowed the player to change the timbre and character of the sounds. A later (1938) version of the instrument featured microtonal tuning as specified by the Hindu poet Rabindranath Tagore and the musician Alain Danielou. 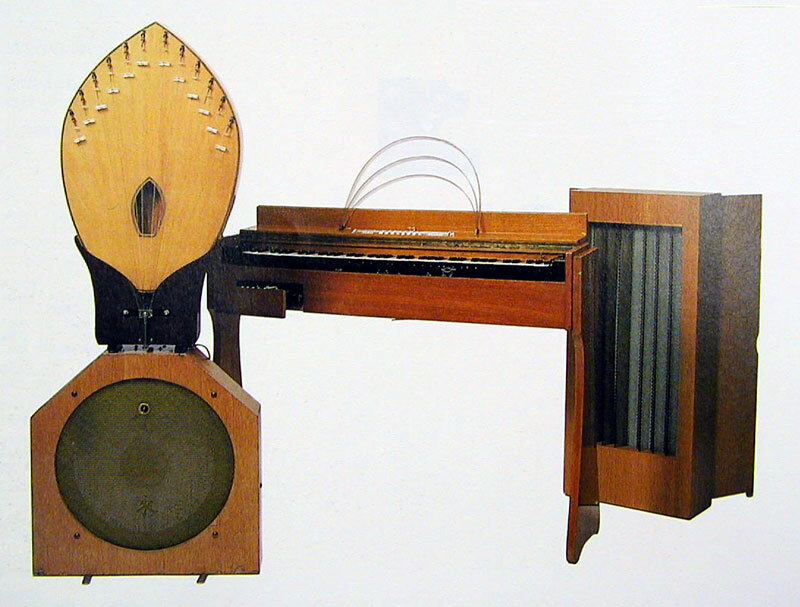 The Ondes-Martenot was quickly accepted and became one of the few electronic instruments to be admitted to the orchestra (at least in France) and had a wide repertoire by prominent composers such as Edgard Varèse, Olivier Messian (The “Turangalîla Symphonie” and “Trois Petites Liturgies de la Presence Divine” amongst others ), Darius Milhaud , Arthur Honegger, Maurice Jarre, Jolivet and Koechlin. Congratulations for your fantastic collection, and thank you for maintaining and enrichening it after so many years. 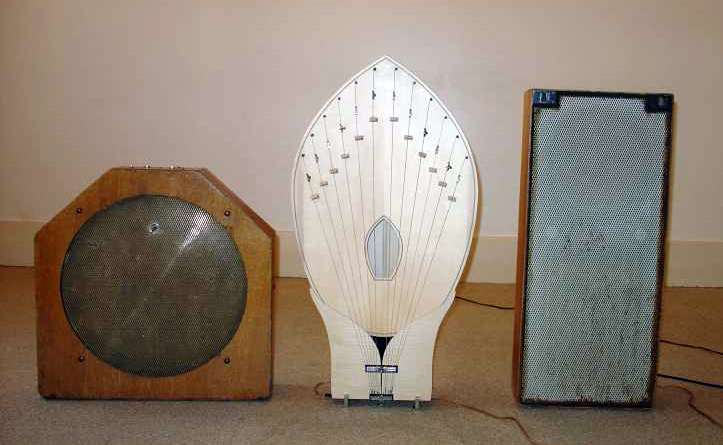 On the other hand, Theremins’s instrument obviously inspired Martenot’s very first Model (may 1928) : the gestures are identical, althought Martenot used wire and key controls instead of “air” playing. When, in the 1970’s, he was asked by jean Laurendeau if he attended the – triumphal – Paris demonstration that Theremin gave at the opera a few months before, and which seems to have triggered the urge to achieve a first version of his Ondes, Martenot said he “did’nt remember”. As a matter of fact, Martenot did his best – and succeeded – to “forget” the theremin and claim for unique and better features. 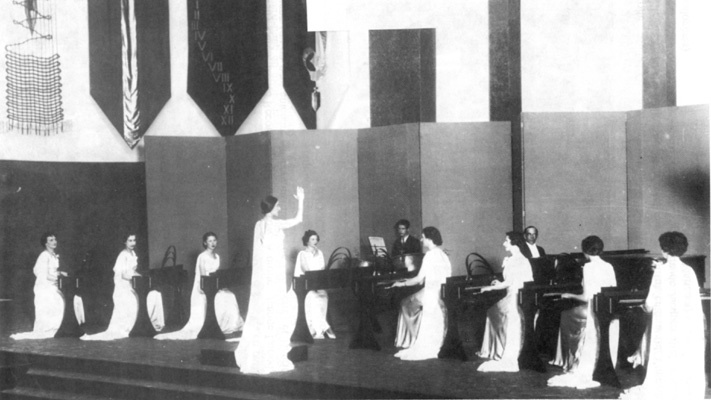 The ondes martenot and the the theremin were developed independently by their inventors. There is no evidence at all that Maurice Martenot met Lev Termen in 1923 since, in order for such a meeting to occur, Martenot would have to have travelled to Russia – which he did not. The inventors were both wireless radio operators in World War One, and both based their musical instruments on the “audion tube” patented by Lee de Forest in 1906. It is unthinkable that Martenot would not have attended the December, 1927, demonstration of “les ondes éthérées” of Leon Theremin at the Paris Opera, and I imagine he was greatly upset by what he saw (hence Martenot’s inability to recall the event). He just didn’t want to discuss it with his biographer, Jean Laurendeau! Martenot, at the end of the war in 1918, was already demonstrating the heterodyne phenomenon to his fellow soldiers in the field. He would play simple melodies gesturally on his radio equipment and the men in his unit jokingly dubbed the sound he produced “le chien mexicain” (the Mexican dog) because of the resemblance of the phenomenon to the howling of a chihuahua! Thanks for the great info! Can anyone recommend resources that discuss the early stages of Martenot’s work with this technology, particularly during and just after the war? I hear similar stories in various blogs and forums, but I am having little luck with any citable sources. The only really authoritative work on the life of this instrument and its creator is Jean Laurendeau’s invaluable “Maurice Martenot, luthier de l’électronique” published in 1990. I’ve spoken with Jean and there is interest in a reprinting with some additional information presented, and there may even be an English translation of there is sufficient interest and resources. Having the read the book and spoken with Jean, I find it exceedingly unlikely that this meeting ever took place. When Theremin presented his instrument in Paris, Martenot was said to have been disappointed that he was beaten to the punch, as he felt that he was close to finishing his first model of ondes Martenot when the Theremin arrived out of the blue. Thanks for your comments, and, it would be great to see a reprint of Jean’s book! Is this instrument still used today? In music and/or orchestras?